The Fed’s preferred price gauge -- tied to consumption -- fell 0.1 percent in January from the previous month and was up 1.4 percent from a year earlier, matching the annual projection with the slowest reading since late 2016. Excluding food and energy, so-called core prices rose 0.1 percent, less than estimated. The index was up 1.8 percent from January 2018, also below forecasts, after an upwardly revised 2 percent gain. A report Thursday showed the expansion decelerated to a 2.2 percent pace in the fourth quarter, and economists surveyed by Bloomberg project 1.5 percent this quarter, the slowest in two years. The spending data add to signs of weakness just ahead of the February retail sales report Monday. The update will be closely watched after December transactions plunged 1.6 percent, the most since 2009, before rebounding in January. 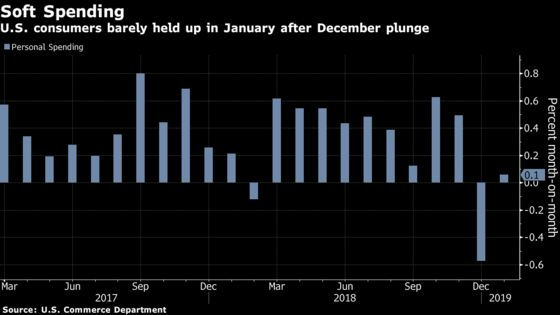 The median forecasts in Bloomberg survey called for spending to advance 0.3 percent in January and incomes to increase 0.3 percent in February. The data did not include February figures on spending or PCE inflation because of delays related to the five-week shutdown that ended Jan. 25. The next report on April 29 will combine personal spending and PCE price data for February and March with income figures for March, according to the Commerce Department. Adjusted for inflation, January spending on goods dropped 0.2 percent on a monthly basis while purchases of services increased, driven by financial services and insurance. The saving rate fell to a still-elevated 7.5 percent in January from 7.7 percent the prior month. The slower-than-forecast core inflation gives Fed officials time to wait for signs of a pickup before considering resuming their hikes. Chairman Jerome Powell said this month rates could be on hold for “some time” as inflation remains muted and global risks cloud the outlook. While the central bank targets 2 percent inflation including all items, it looks to the core gauge as a better indicator of underlying price trends. Minneapolis Fed President Neel Kashkari said Friday that he expects economic growth in 2019 and 2020, though it’s always possible there will be a recession. Wage growth is ticking up but isn’t fueling higher inflation, he said in a Fox Business Network interview, adding that it’s “way too soon” to make judgment on rate moves next year.